This Oreo Sugar Cookie Parfait is the ultimate single serving treat that you can have ready in 5 minutes flat! 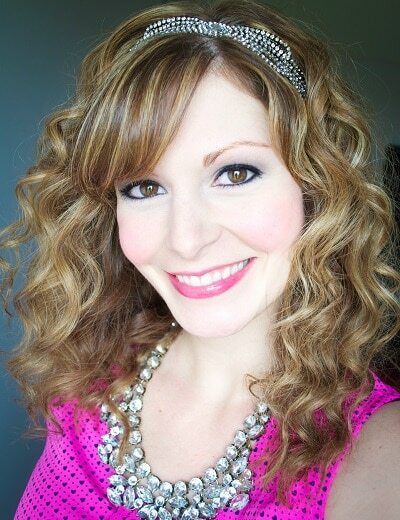 You can easily multiply the recipe and have the perfect party treats! 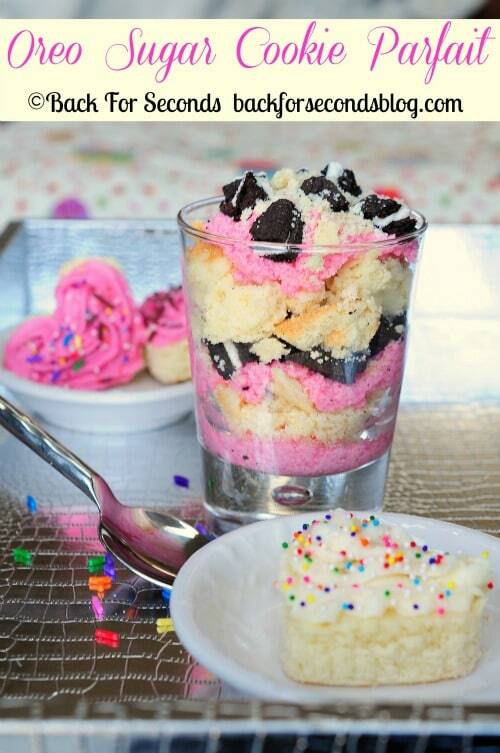 Oreo Sugar cookie Parfaits for everyone! A few weeks ago I shared my favorite recipe for Easy No Roll Cakey Sugar Cookies and I decided to make them again on Valentine’s Day. My daughter and I wanted to make heart cookies but I really didn’t want to roll out any dough. So I made the dough as usual, but instead of rolling and cutting out shapes, I just pressed it into a jelly roll pan, baked it for about 15 minutes, and used cookie cutters to cut out our shapes! Much easier. A parfait! And what could be better than a parfait with sugar cookies and oreos?? I’ll admit, at first I thought it might be too sweet. I actually don’t like really sweet things. Crazy, I know. So I added some plain yogurt to the frosting to mellow out some of the sweetness while still keeping it creamy and luscious. Oh my word. This was so much better that I expected. I couldn’t put the spoon down! 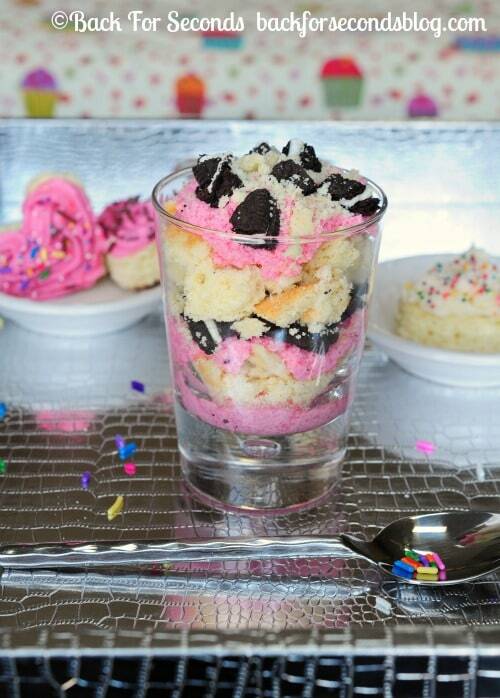 I think these Oreo Sugar Cookie Parfaits would be adorable for a party! You could dye the frosting any color – even have each individual one a different color! The options are endless. I think every time we bake sugar cookies I will be freezing the scraps so they are handy when a craving hits for an Oreo Sugar Cookie Parfait! These are so cute! My kids would love these…though not more than me! Oreos and sugar cookies are my favorite! I don’t know about anyone else, but I certainly can’t think of anything better than a sugar cookie and oreo parfait all to myself. 🙂 Yogurt, frosting, cookies. I can have that for breakfast, right?! Too pretty to eat–but I’d probably give it a try anyway. 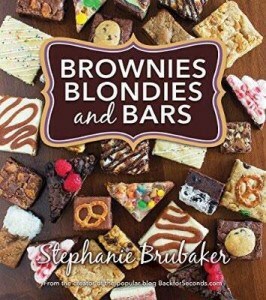 Stephanie, This looks so yummy! I love the mix of colors and that it is served in the clear glass! This is very cool! I love it! Its full of pink and chocolate! Whats not to like! WOW! These look sooo good. These are going to be perfect for tea time with my little girl. 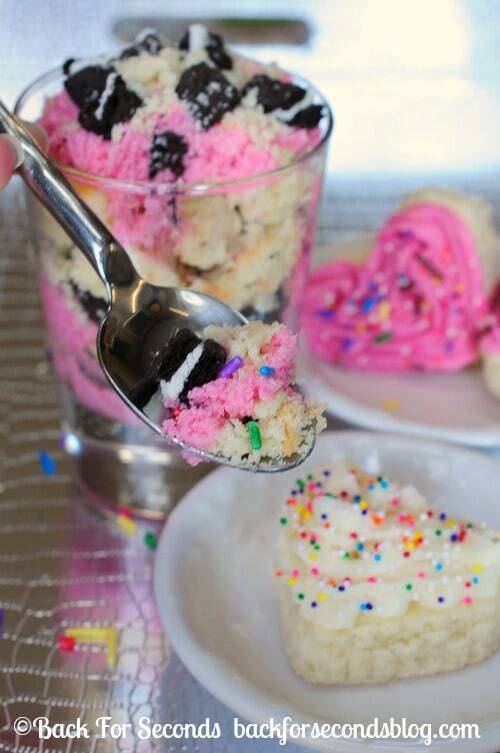 Oreos and Sugar cookies. Also I think the Yogurt gives it a great texture. Thanks for sharing! My nieces will be coming over this weekend and they are big Oreo fans. I have been on an Oreo binge the past couple of weeks, so they are definitely going to enjoy this. Great recipe!